Besides being close (in proximity) to my family, the thing I miss the most about living in Louisiana is the food. (Really, does this surprise anyone about me?) This being Mardi Gras season, I especially miss King Cake. 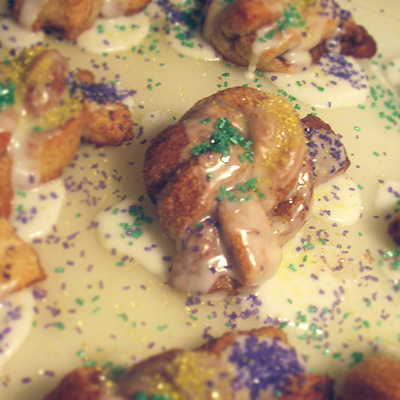 These yummy little King Cake Knots are the perfect solution! All the cinnamon-y goodness of King Cake without the tiresome work of making the King Cake (they’re not so easy…if you want to do it right). This recipe from Plain Chicken uses prepared french bread dough (find it with the refrigerated crescent roll, biscuit and cinnamon roll dough in the tubes). So simple! Preheat the oven to 350. Spray a baking sheet with butter-flavored cooking spray. 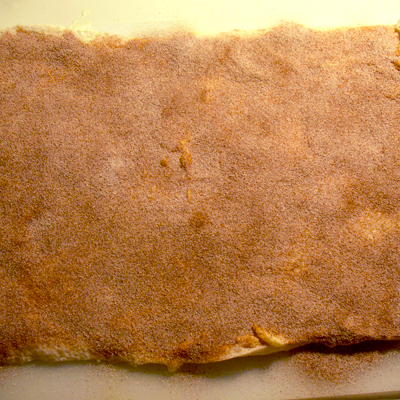 Find the seam in the french bread dough and unroll it into a rectangle. 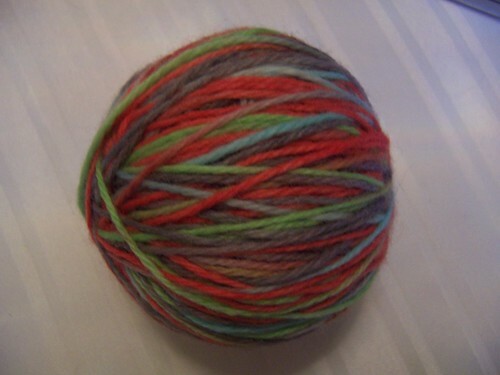 Shape until it is about 16 by 12 inches. Brush the dough with softened butter. Mix together the cinnamon and sugar and spinkle liberally over butter. Cut the dough in half lengthwise. 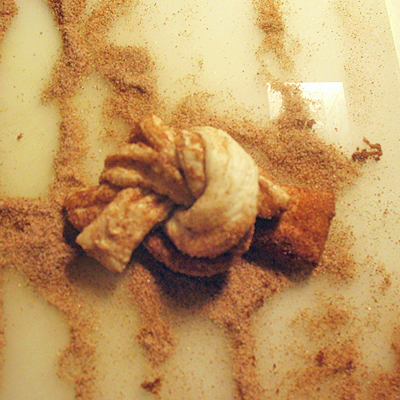 Stack two strips together, cinnamon sides facing each other. Twist the strips together. 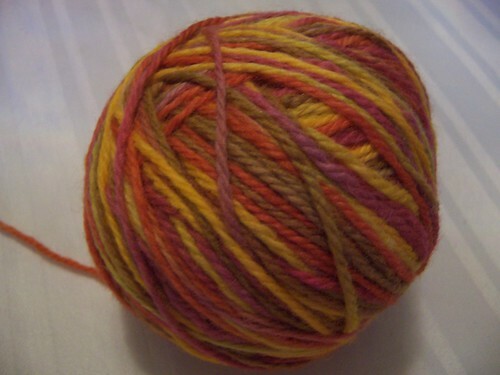 Tie them loosely in a knot, stretching gently if necessary. Place on baking sheet 2 inches apart. Bake 25 to 28 minutes, until golden brown. Allow to cool completely. Meanwhile, mix together powdered sugar and milk. Dip the top of each knot in the icing. Sprinkle each with yellow, green and purple sanding sugar or sprinkles. Preheat oven to 350. Spray a baking sheet with butter-flavored cooking spray. 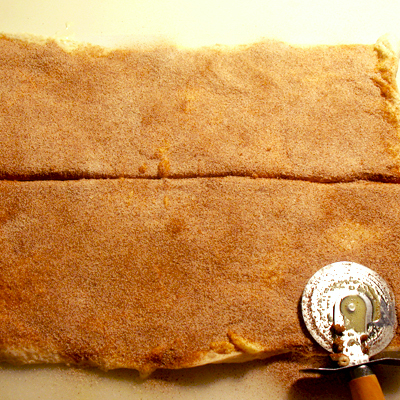 Find the seam in the french bread dough and unroll into a rectangle. 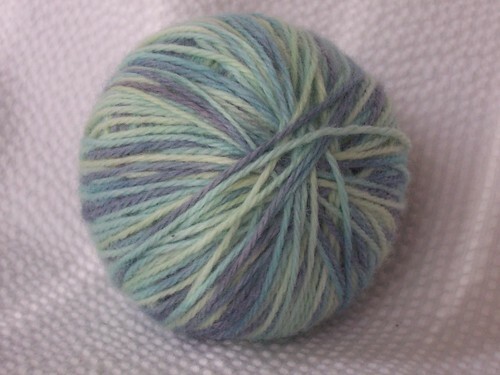 Shape until it is about 16 by 12 inches. Brush the dough with softened butter. Mix together the cinnamon and sugar and sprinkle liberally over butter. 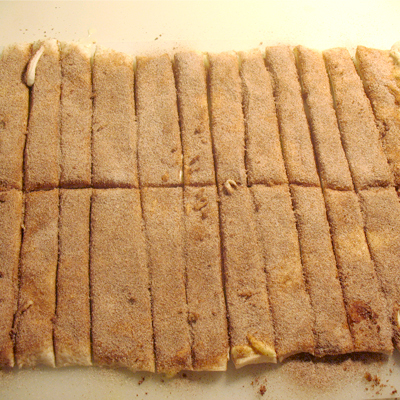 Cut the dough in half lengthwise, then crosswise into 8 strips. 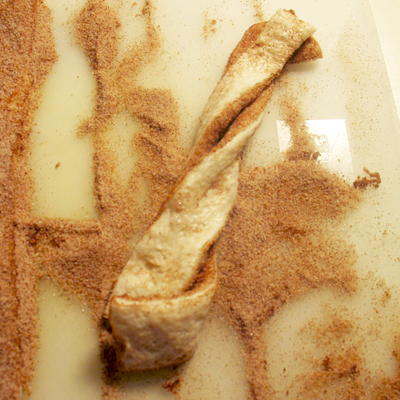 Stack two strips together, cinnamon sides facing each other. 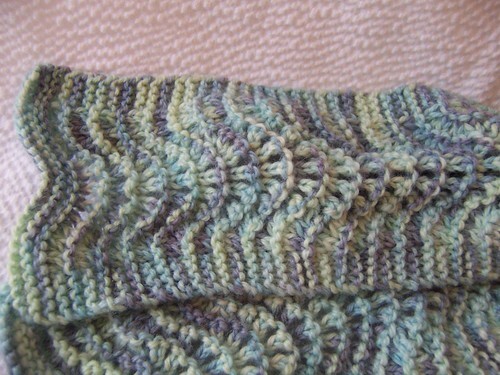 Twist the strips together. Tie them loosely in a knot, stretching gently if necessary. Place on baking sheet about 2 inches apart. Bake for 25-28 minutes, until golden brown. Allow to cool completely. Meanwhile, mix together powdered sugar and milk. Dip the top of each knot in the icing, then sprinkle each with yellow, green and purple sanding sugar or sprinkles. When I saw this recipe over at Sing for Your Supper, I knew immediately I had to make it. And it is some kinda good! 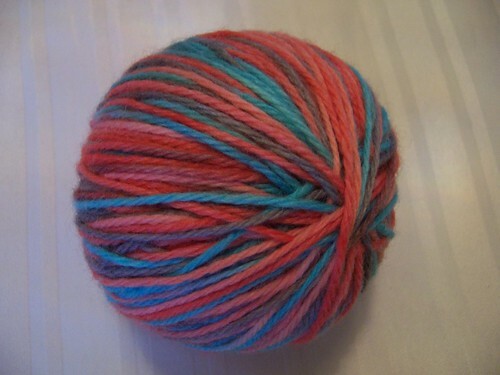 I brought it to our Super Bowl Party and it was gone before I knew it. In a small saucepan, melt butter over medium-high heat. 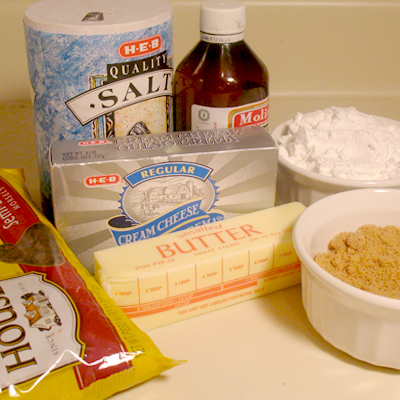 Put the softened cream cheese and powdered sugar in a separate bowl. Cream them together until well combined. 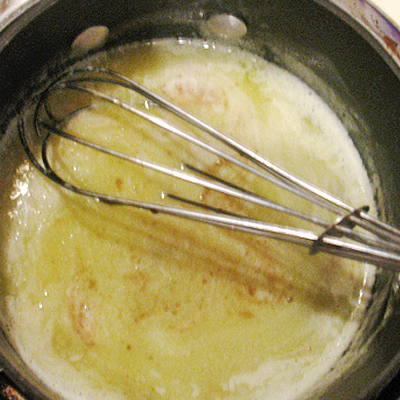 Turn mixer to low and add in brown sugar/butter mixturre and salt. Blend until well combined. 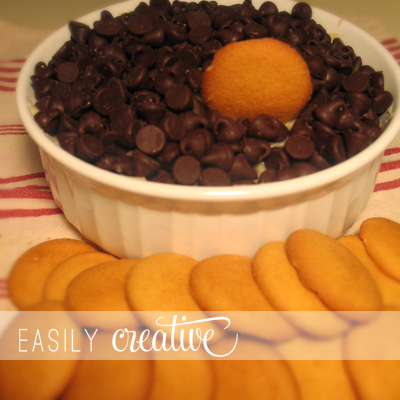 Mix in 1 cup semi-sweet chocolate chips. Reserve the rest to sprinkle on top of the dip. Yummy! 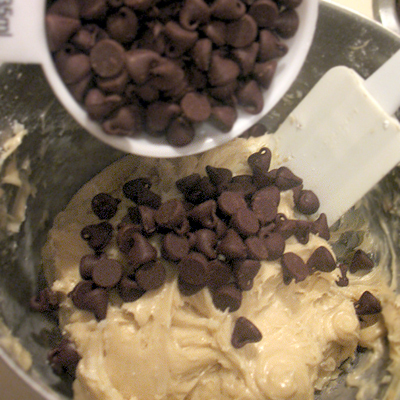 Transfer to serving bowl and sprinkle with remaining chocolate chips. Serve with Nilla Wafers, graham crackers, or your cookie of choice. 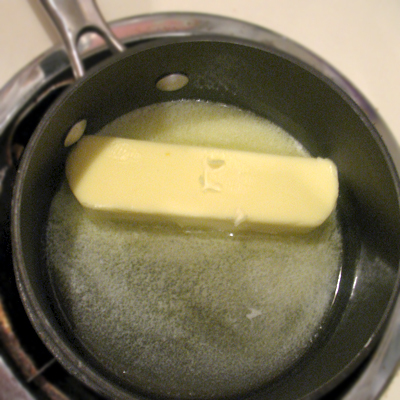 In a small saucepan, melt the butter over medium heat. 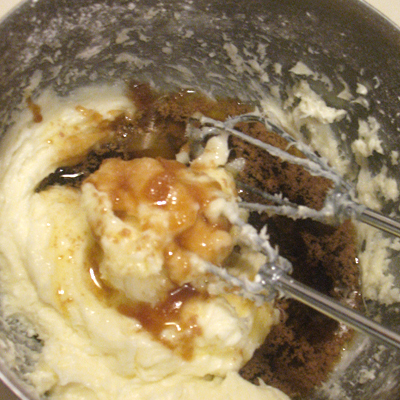 Whisk in the brown sugar until it dissolves and the mixture starts to bubble. Stir in vanilla and set aside to cool. 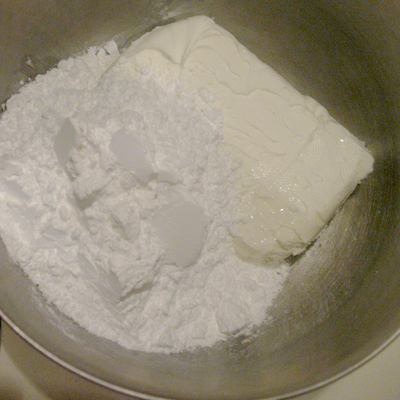 In a separate bowl, cream the cream cheese and powdered sugar together. With the mixer on low speed, add in brown sugar and butter mixture, then the salt. Mix until well combined. Stir in 1 cup of semi-sweet chocolate chips. 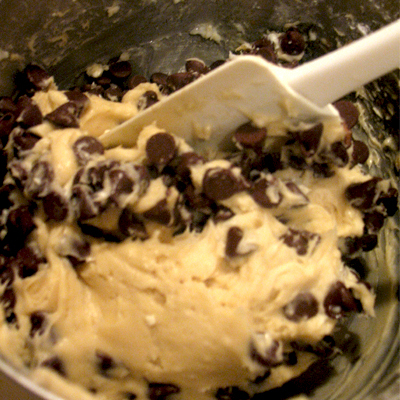 Transfer to serving bowl and sprinkle with remaining chocolate chips. Serve with Nilla Wafers, graham crackers, or the cookie of your choice. These were a little more involved, but the kids loved rolling the dough into balls. My daughter also helped dip the cookies in white chocolate. A little messy, but fun. These were another Pinterest find. (Do you follow me on Pinterest?) The yummy recipe is from Better Homes and Gardens. 1. Preheat oven to 325 degrees F. Spread cherries on paper towels to drain well. 2. In a large bowl, combine flour and sugar. 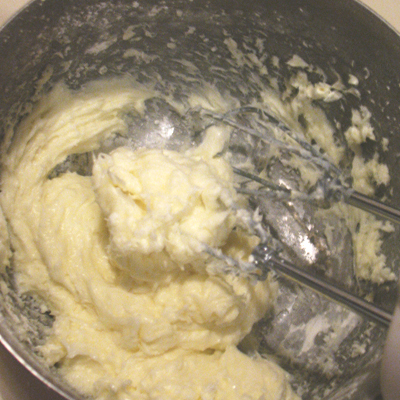 Using a pastry blender, cut in the butter until mixture resembles fine crumbs. Stir in drained cherries and 4 ounces (2/3 cup) of the chopped chocolate. Stir in almond extract and, if desired, food coloring. Knead mixture until it forms a smooth ball. 3. Shape dough into 3/4-inch balls. Place balls 2 inches apart on an ungreased cookie sheet. Using the bottom of a drinking glass dipped in sugar, flatten balls to 1-1/2-inch rounds. 4. Bake in preheated oven for 10 to 12 minutes or until centers are set. Cool for 1 minute on cookie sheet. 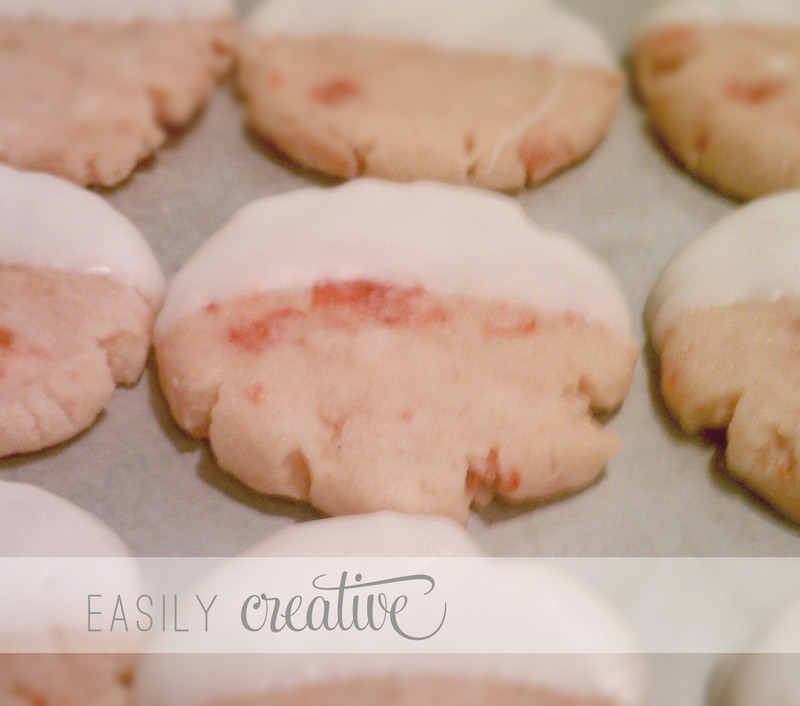 Transfer cookies to a wire rack and let cool. 5. 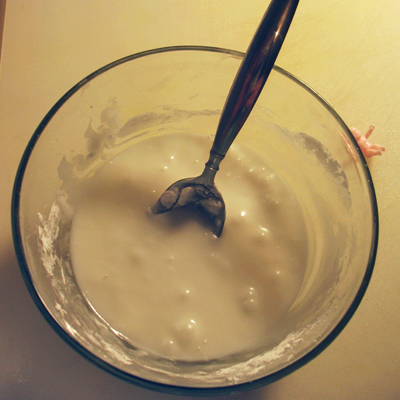 In a small saucepan, combine remaining 8 ounces white chocolate and the shortening. Cook and stir over low heat until melted. Dip half of each cookie into chocolate, allowing excess to drip off. If desired, roll dipped edge in nonpareils and/or edible glitter. Place cookies on waxed paper until chocolate is set. Makes about 60. 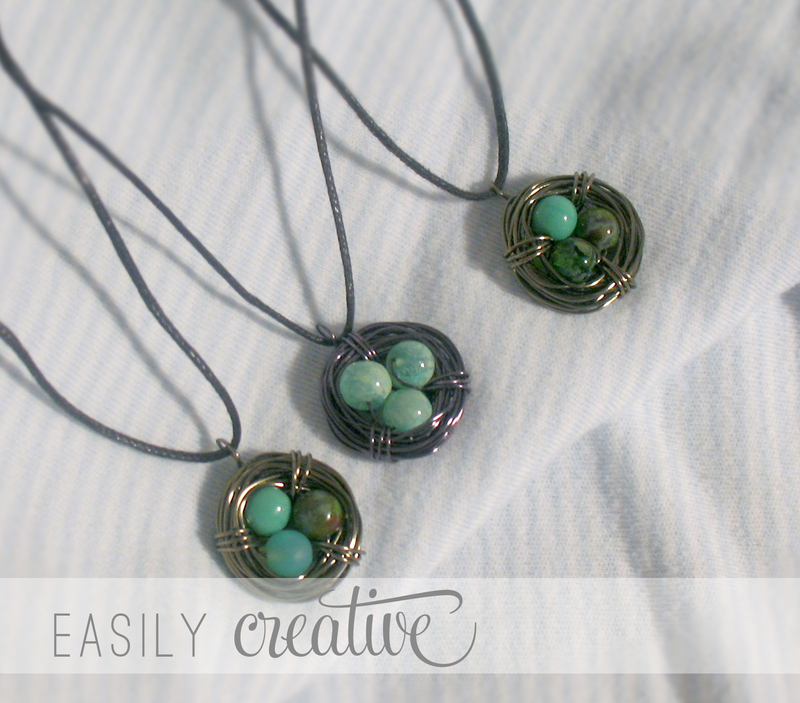 I fell in love with these adorable necklaces when I saw them on Etsy. Imagine my delight to find DIY instructions on Pinterest! I bought the supplies on Black Friday with a Michael’s coupon. I didn’t have any needle-nose pliers or wire cutters, so I bought a set. I used waxed linen cord instead of the chain (because it was cheaper) I spent about $10 for the wire, beads, cord and findings. The little nests only take 5 to 10 minutes to make. I made a few each night while watching TV with the hubby. It took me a couple of practice runs before I got the hang of wrapping the wire securely. Keep playing with it until you find a method that works well for your hands. Follow the tutorial I used on SarahOrtega.com. 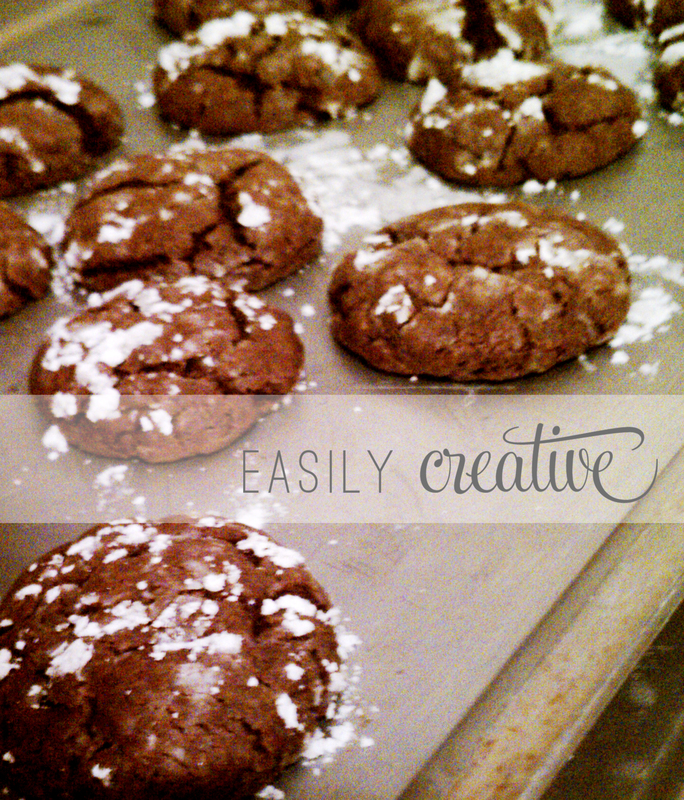 We made these tasty little treats to give as Christmas cookie gifts. Hardly any made it out of the kitchen! They are exactly as the name describes: gooey, butter-y, chocolate-y. And they’re from Paula Deen. Does it get any more decadently delicious? 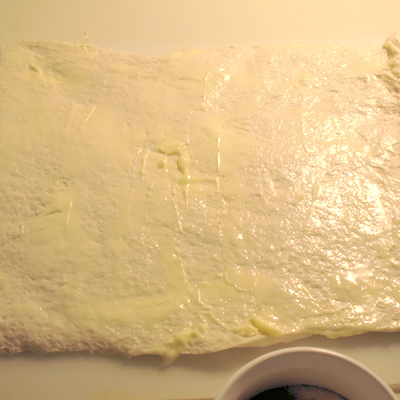 Preheat oven to 350 degrees F. In a large bowl with an electric mixer, cream the cream cheese and butter until smooth. Beat in the egg. Then beat in the vanilla extract. Beat in the cake mix. Cover and refrigerate for 2 hours to firm up so that you can roll the batter into balls. Roll the chilled batter into tablespoon sized balls and then roll them in confectioner’s sugar. Place on an ungreased cookie sheet, 2 inches apart. Bake 12 minutes. The cookies will remain soft and gooey. Cool completely and sprinkle with more confectioners’ sugar, if desired. I would want to read this book even if it wasn’t free. The title sounds so wonderful: Organized Simplicity. Give me some of that. …At the foundation of this book is the idea of redefining simplicity. You must understand simple living as something more than just a catch phrase, some pie-in-the-sky ambition, a trend. Only then will you find the motivation to create a simpler life that works for you, your family, and your home.